As veteran readers know, these pages have cornered the market on a handful of sub-threads in the wide world that is the Catholic beat. But one of the biggest splashes has come courtesy of the now-excommunicated Archbishop Emmanuel Milingo, the Zambian prelate whose colorful adventures in marriage, Moonies and soul music -- not to mention his famous (or infamous, depending on how one views things) exorcisms -- have given him an outsized profile in the world press and made the controversial cleric a figure of unusual fascination. Last July, after Milingo had gone missing for three weeks, Whispers first broke news of his impending reemergence at the helm of a Unification church-backed movement intended to "reconcile married priests" with the Catholic fold. 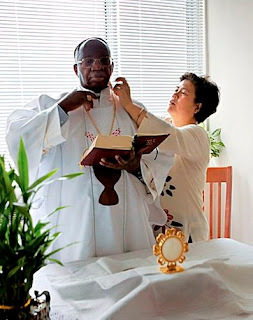 At the same time, the archbishop announced his return to Maria Sung, the Korean acupuncturist he married at a 2001 Unification mass-wedding in New York and subsequently . Then, there was the news that Milingo was consulting on Dan Brown's latest project, a book on exorcism. Shortly thereafter, after repeated Roman entreaties to return, he ordained four married clerics of the Old Catholic line as bishops, and the Holy See promptly replied by excommunicating Milingo and announcing that any of his ordinations would not be accepted as valid. In December, he continued along the path, ordaining two married men to the priesthood at the close of a New Jersey convocation of his movement, "Married Priests Now!" Milingo gave an interview (and musical performance) to PRI's The World shortly after the new year. The Washington Post features the first extensive piece on the renegade prelate, written by Peter Manseau, author of Vows, a memoir recalling his experience as the son of a onetime priest and nun. His hands and chin rising and falling to slightly different tempos, he swayed where he stood, dressed entirely in priestly black. His dark socks tapped on the beige carpet. A heavy pectoral cross clacked like a metronome against the buttons of his suit coat; its silver chain twinkled against his Roman collar. "Music is too strong as a passion for me," he said as the tape played on. "I do not allow myself to dwell too much on it, because it is so strong." His other passion, the one I had come to speak to him about, is his church. On that, he does allow himself to dwell, much to the Vatican's chagrin. Not long after moving to Washington from Rome last summer, he was excommunicated for repeatedly and publicly defying the orders of his ecclesiastic superiors. He is living now as a kind of religious refugee. Nonetheless, he says he has kept the faith. "I am Catholic from head to foot," Milingo assured me. He had arranged one of the small rooms in his new apartment as a makeshift chapel, praying there each morning before the sun lighted up his building's view of Rock Creek Park. Pictures of his beloved spiritual protector, Pope John Paul II, hung on nearly every wall. Milingo had not been the sort of progressive cleric one might expect to agitate for change in one of the church's most distinctive disciplines. In fact, until then he had seemed a Catholic from the earliest days of the church's history, a Latin-preferring traditionalist who had come to prominence in Africa as an exorcist and faith healer. Yet somehow, this theologically conservative priest wound up taking part in a classic Unification wedding: 62 couples dressed in identical tuxedos and bridal gowns, all standing before Moon as he gave his blessing and invoked three cheers of " Ok Mansei!" a Korean valediction by which all participants wished "ten thousand years of victory" to Moon as the "True Father" of humanity. Though the wedding had taken place in New York, its most immediate impact was felt in Italy, where Milingo's renown was such that he had recorded two popular albums of Zambian songs, and had even seen the story of his life turned into a cartoon. The Italian media speculated that Milingo had been brainwashed or otherwise coerced into marriage. The Vatican's official exorcist, Father Gabriele Amorth, suggested that Moon's followers had pursued his former colleague "relentlessly." From there, the suspicions snowballed: The emergence of a rogue clergyman armed with the power to ordain new bishops and priests of his choosing brought whispers of a possible schism, a split among the faithful in the mold of the Reformation. Some feared that Milingo intended to start a breakaway church in Africa, with himself as spiritual leader and Moon as his string-pulling financier. On a continent where the number of Catholics has almost tripled in the last 30 years -- as numbers elsewhere have plunged -- such a move by one of its most popular native sons might prove disastrous, from the Vatican's perspective. Milingo denied that he had any such ambition but gave ample evidence that he had wandered far from the only church he had ever known. In binding the Catholic priesthood to the sacrament of marriage, "we will strengthen and renew the two parts, while at the same time building a greater and stronger whole," Milingo wrote in a July 2001 response to the Catholic Church's admonitions. "This is what God is asking." Milingo spoke of his marriage as divinely inspired and, asked at a news conference about Moon's theology, went so far as to propose that Jesus had been "killed before He was able to carry out His plans" -- a suggestion that contravenes the central Christian tenet of Christ's "perfect sacrifice," while neatly fitting Moon's assertion that he is on Earth to finish Jesus's work. But Milingo's disobedience apparently could not withstand a direct plea from the pope. When John Paul II asked him, "in the name of Jesus," to come back to the church, that's what he did, leaving his wife 10 weeks after their wedding. Even Maria Sung's 16-day hunger strike couldn't get Milingo back. Until, that is, last June, about five years later, when Milingo disappeared from Italy. His whereabouts remained unknown long enough that the Zambian government asked the Vatican to find him. In July, he reemerged, in typical attention-grabbing fashion, at the National Press Club in Washington. Not only had he returned to his wife, he announced, but he would now begin a mission to remove the requirement of celibacy from the Roman Catholic priesthood. Some took this as a sign that he had been brainwashed, after all; that the rumors of Milingo returning to Africa as the Unification Church's puppet pope were true. And Milingo only fed that speculation when, in September, he consecrated four married men as bishops -- an act which, according to the Vatican, brought him automatic excommunication. "Nonsense," Milingo says. "I do not believe in excommunication." He gave his mission a name -- Married Priests Now -- and acknowledged assistance from Moon. However, Milingo said, it was not Moon who had persuaded him to again take up challenging the celibacy of priests as the rule of his church. "Jesus said to me, 'You are timid,'" he told me later. " 'You are timid to have begun this only to walk away.'" As is often the case with people who say they receive direct messages from the divine, the whole story is in fact a bit more complicated than that.